June 1, 2017, 8:20 p.m.
June 1, 2017, 8:21 p.m.
We wanted to give you an update regarding the use of Denuvo anti-tamper software in RiME. Today, we got word that there was a crack which would bypass Denuvo. Upon receiving this news, we worked to test this and verify that it was, in fact, the case. We have now confirmed that it is. As such, we at Team Grey Box are following through on our promise from earlier this week that we will be replacing the current build of RiME with one that does not contain Denuvo. 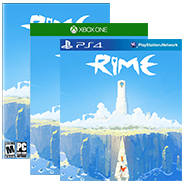 Please make sure your PC version of RiME has been updated, if it has not done so automatically. Team Grey Box is also committed both to supporting the games we publish and to our player base, so this is definitely not the final update you will see with RiME. We are currently working on our first traditional patch, which we are aiming to release next week. This patch will provide a fix for the VR initialization bug, and will also provide a fix to some specific instances of hardware-related crashes, among other updates which will be detailed at the time. We sincerely thank players who have reported issues, and a special thanks to those who have worked with us to provide additional details, DxDiag files, and the like. We want to continue giving you the best product we possibly can. Please feel free to reach out to us with any additional questions or concerns you may have. Thanks again for your continued support! June 2, 2017, 2:44 a.m.
June 2, 2017, 3:59 a.m.
Nice! Also I was trying to make a thread in the general discussion area with a thanks and to suggest some improvements but for some reason my post mysteriously disappeared... What happened? Edit: I think I made it appear again. When I replied, it acted like the first post on the thread I think and I guess that caused it to appear on the forums too.